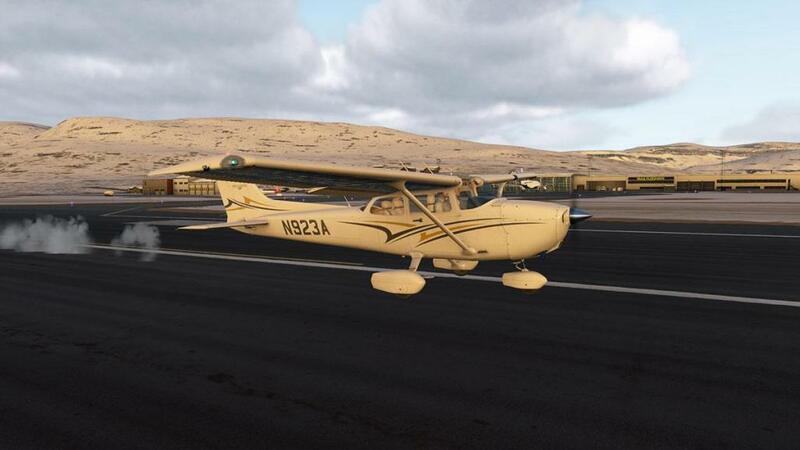 As the Cessna 172SP is overwhelmingly the most popular general aviation aircraft in the world with 44,000+ built since 1955, you can expect then that X-Plane or any other simulator for that matter, has too represent the aircraft on their platform... 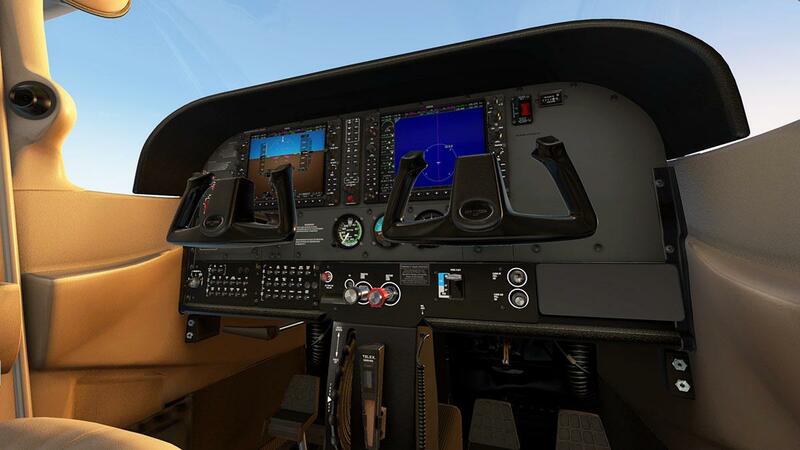 In X-Plane there are quite a few, first and foremost is the default version from Laminar Research in both the analog and G1000 versions, plus the REP (Reality Expansion Pack) for this aircraft from SimCoders. 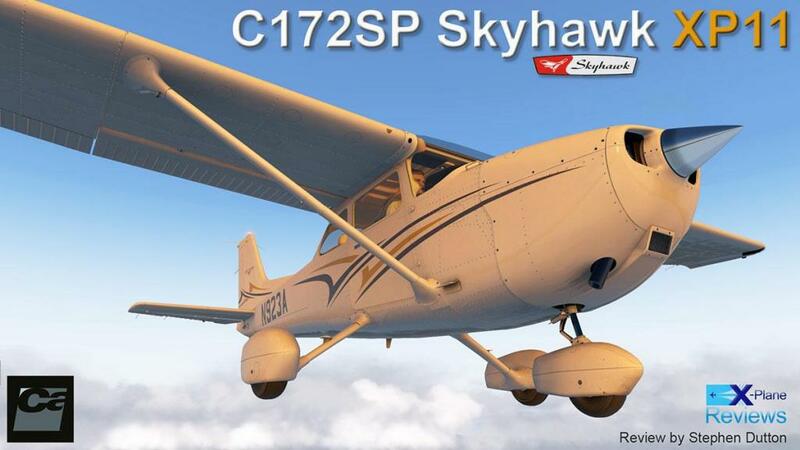 AirFoilLabs also have a very deep version with the same sort of REP pack built in... and so did Carenado with their C172N Skyhawk II. 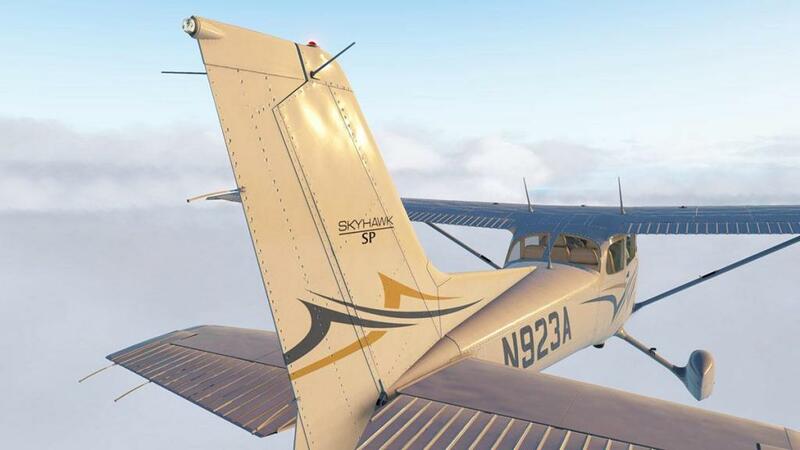 So you have quite a choice of the same sort of C172 design, certainly the Laminar version has an enormous advantage in that it is delivered as part of the simulator and is free. 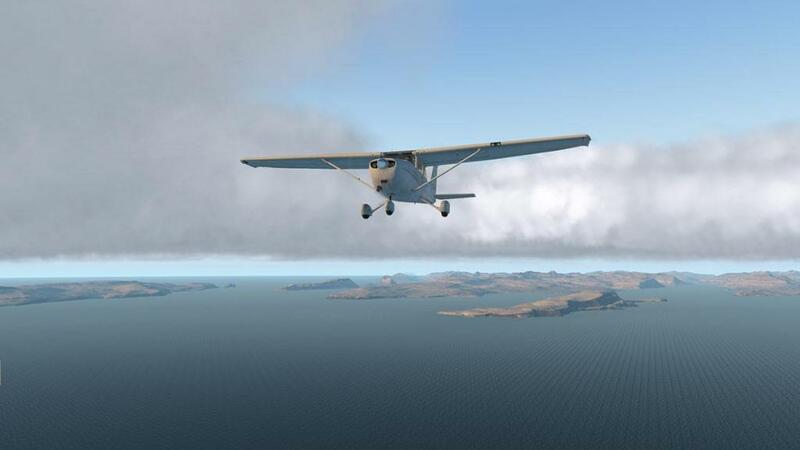 So here Carenado have released the X-Plane11 (and 11.30 compatible) version, but it isn't anything like the earlier C172N. 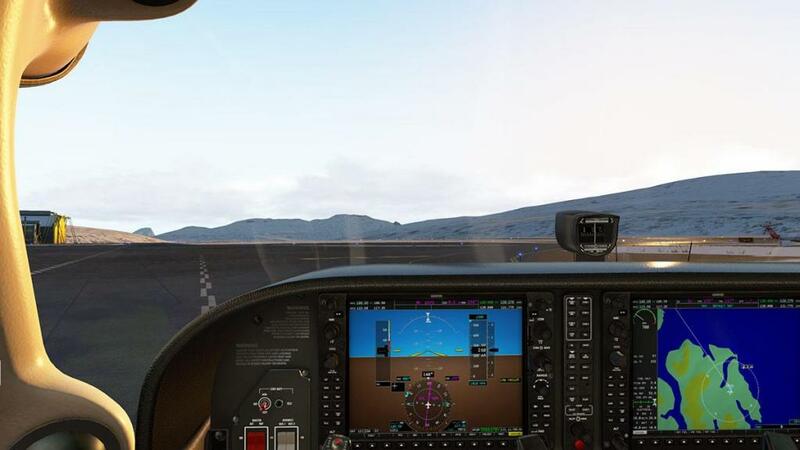 For one the new version is totally rebuilt even redesigned from the ground up and also changed with the (Garmin) G1000 avionics suite, and oddly enough it is the same Laminar system that is installed as the default aircraft. The analog dial version is now gone, as so also has the dual wheel/float versions... it is to say really that the original aircraft has been replaced with a more modern single version of the aircraft. 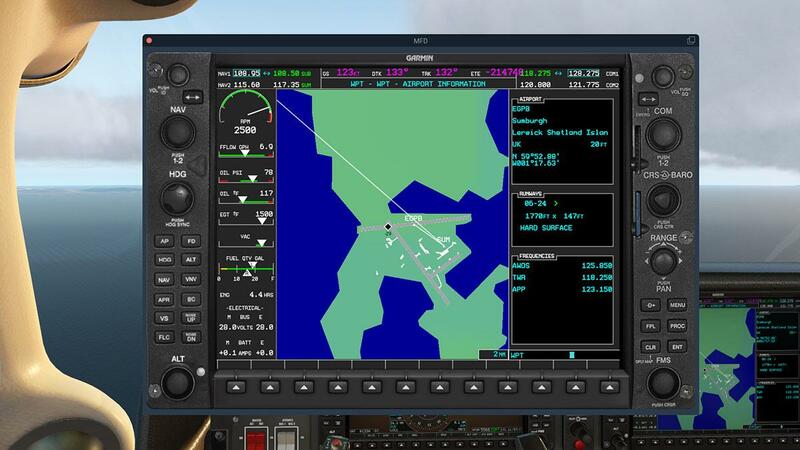 I don't know if the older analog version will still be ongoing and in the future available, but currently it is still displayed on the X-Plane.OrgStore. 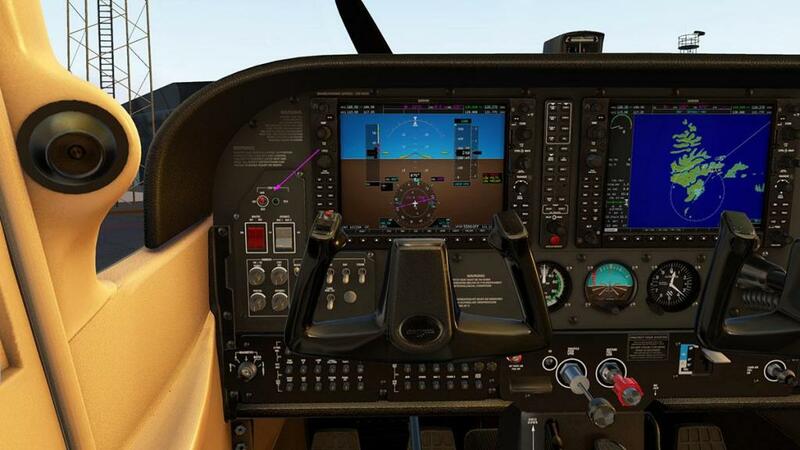 Obviously it is an XP10 aircraft but the aircraft will still fly fine in XP11, but this aircraft doesn't take advantage of the XP11 features. So if you prefer the analog version, then the AirfoilLab version is your best choice, but it is deathly slow.... even with a tail wind! 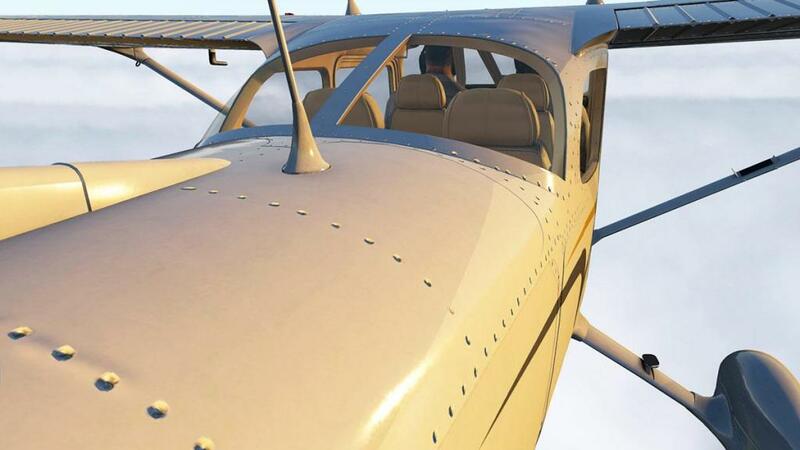 Obviously the point of this review is why pay for an aircraft when there is a pretty good free version, and it is a very fair point. 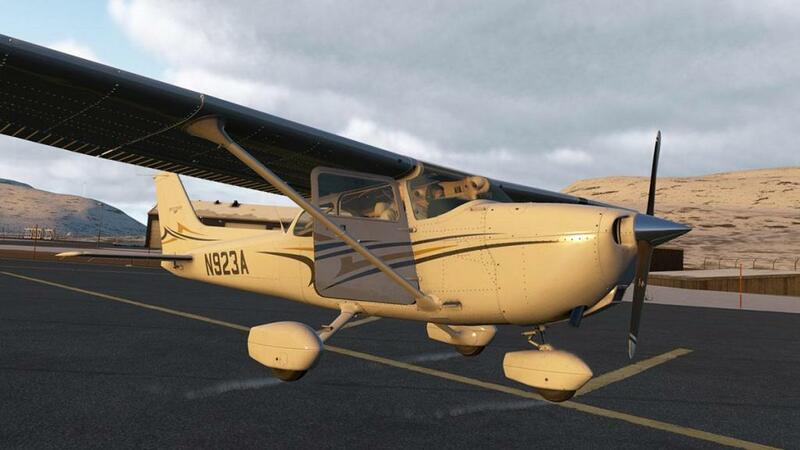 Because at it's heart the C172Sp is a pretty basic aircraft in the first place. So it is hard to distinguish the differences, but they are there, you just have to look for them. 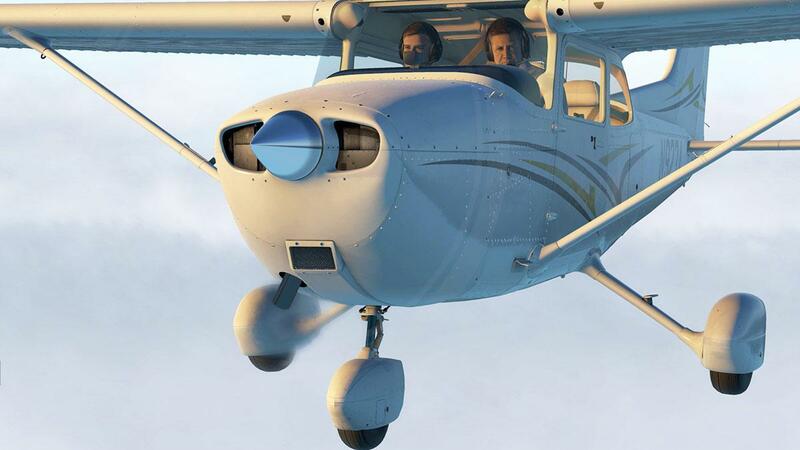 I have always looked at aircraft of the genre in that you don't just buy them just to fly. 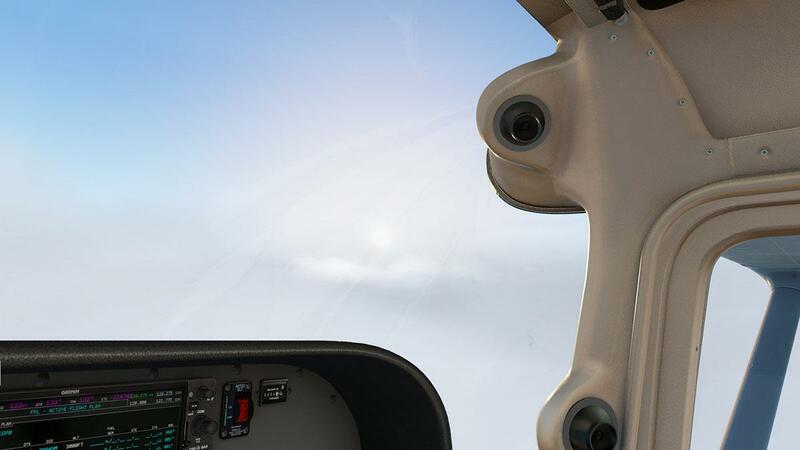 You are in a way more of taking an ownership of them, certainly when it comes to vFlyteAir aircraft... it is a personal thing. 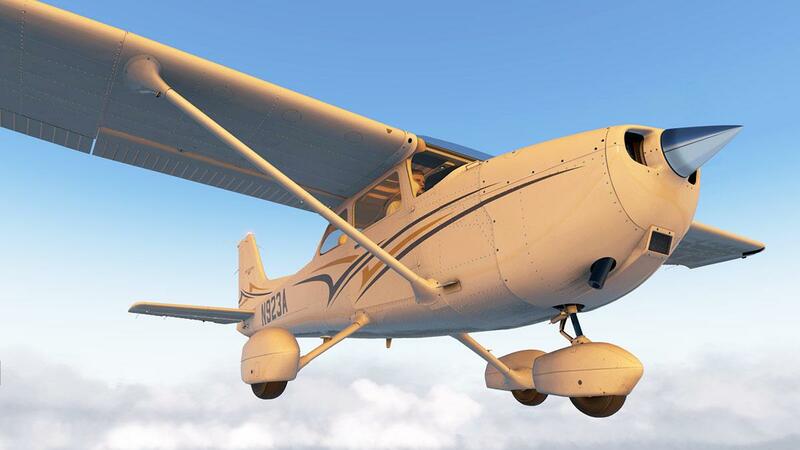 More so if you actually fly a C172, or even more so if you want to fly a C172... or even have done so in the past the significance of ownership is going to be a factor in wanting the aircraft. 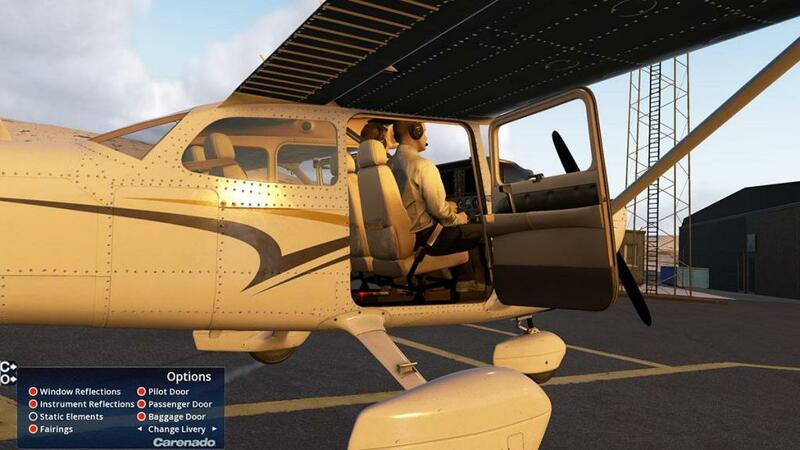 So authenticity is then the main factor here in any purchase in to be as real as the same Cessna is in real life, and that is more important an aspect than what you think it is... more so if you want to spend your flying hours mostly restricted to only a few types of aircraft of which a real world or as a past life pilot would only do so. In that aspect then again the AirfoilLab's version would tick a lot of boxes. 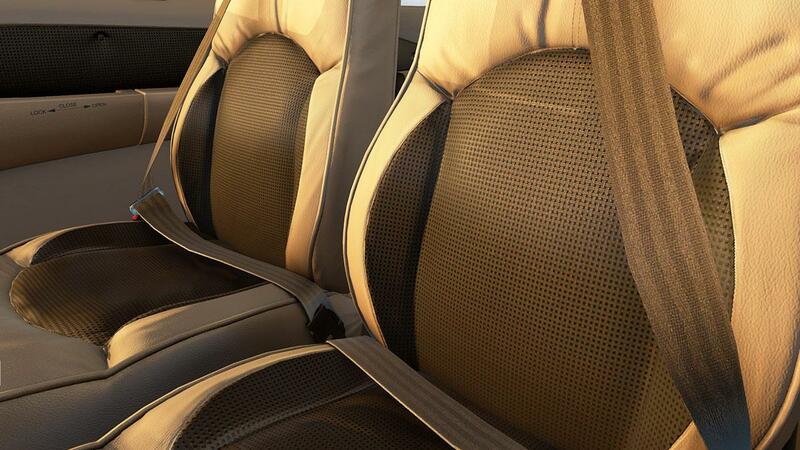 Outwardly developers have always wanted to create aircraft panels with detail, perfect rivets, screws and panel fit. 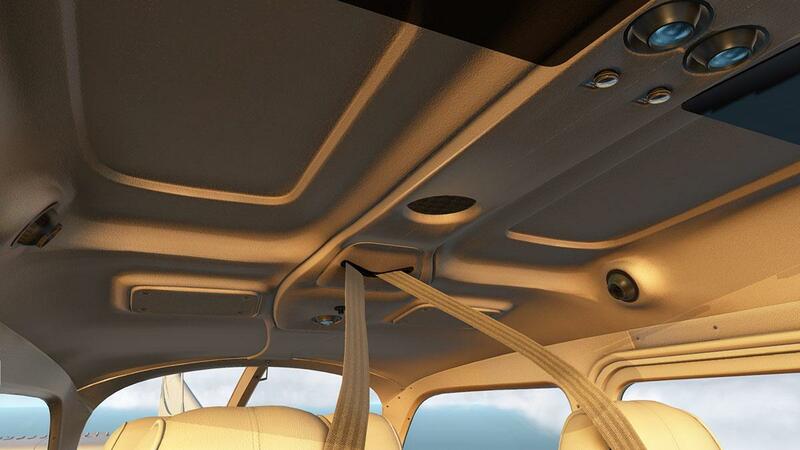 But the realism factor can be a wide margin from flat panels with drawn rivets to the intricate detail... detailing. Careando have here gone that next step further in this aspect. Carenado panels were always very good, and highly detailed. But with a new process they are now taking the quality to another level and using the PBR materials to even a higher level than ever before, and with a better framerate to boot as well. 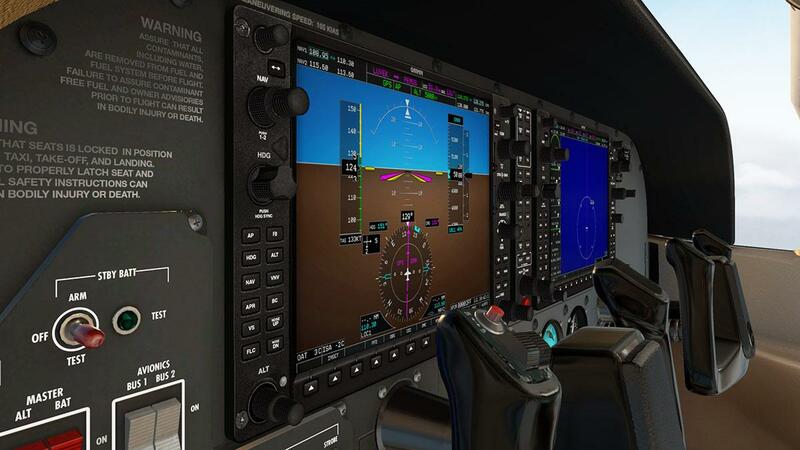 Yes this process has been on most Carenado aircraft on all of their XP11 releases, but not to this newer level as 11.30 pushes the game out further. Note the shape of the tail-fin metal in the light, it is curved or bending as the metal shapes into being pulled or stretched across the aircraft's inner frame, the trick here is that the warping of the surface in an inner dent movement reflects that construction aspect as well as panel fit and outward bulges. 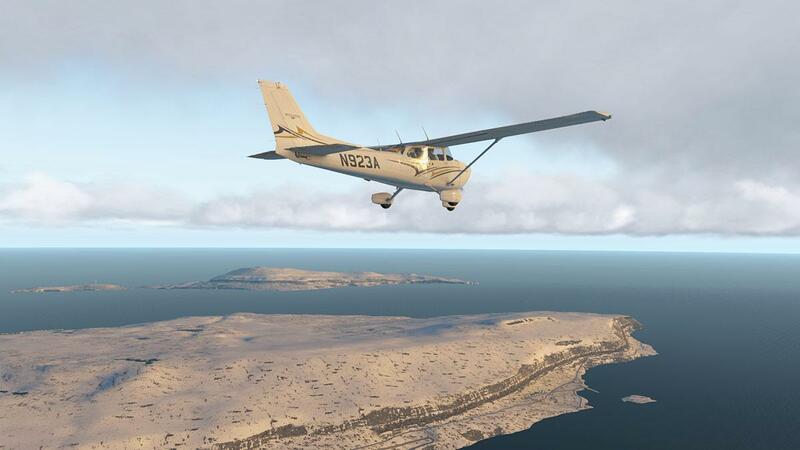 ... what is far more remarkable about these images, is that they are created in the X-Plane quality texture setting of "Maximum" and not in the top notch setting of "Maximum (no compression)" either. 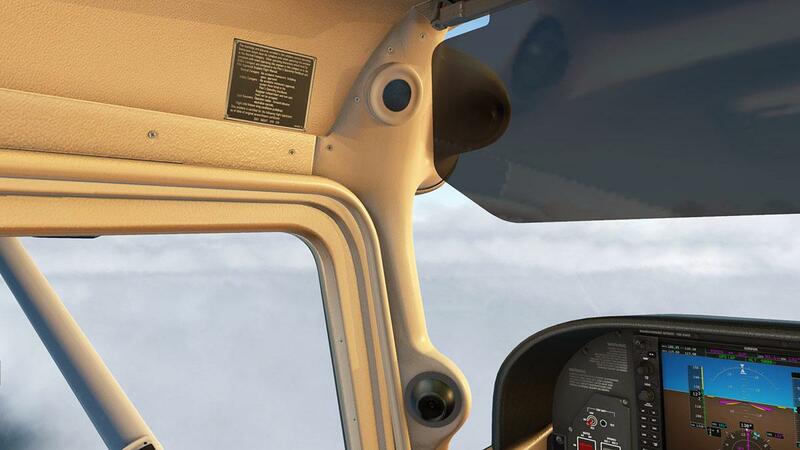 And as we will see the quality of this sort of detail at this setting is set out right throughout the aircraft, so in other words "you can have your cake (In lower quality settings) and eat it as well (with high sharp quality detail graphics). On an odd note though, the lighting wicks are now not animated and don't flicker in the wind, like they used to do on all Carenado aircraft. 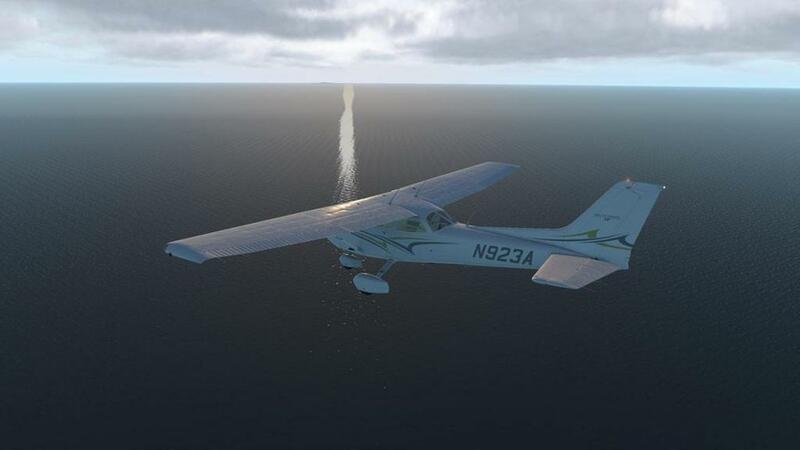 With the 11.30 new dynamic features you get of course particle effects, but to note that there is a difference between the effects in 11.30 and the actually adjusted effects in X-Plane11.30 as shown here... the C172SP was late in release in waiting for Laminar to go 11.30 final, but with that case then you get the effects, and the correctly adjusted ones by the developer now included... more on the 11.30 performance aspect later. 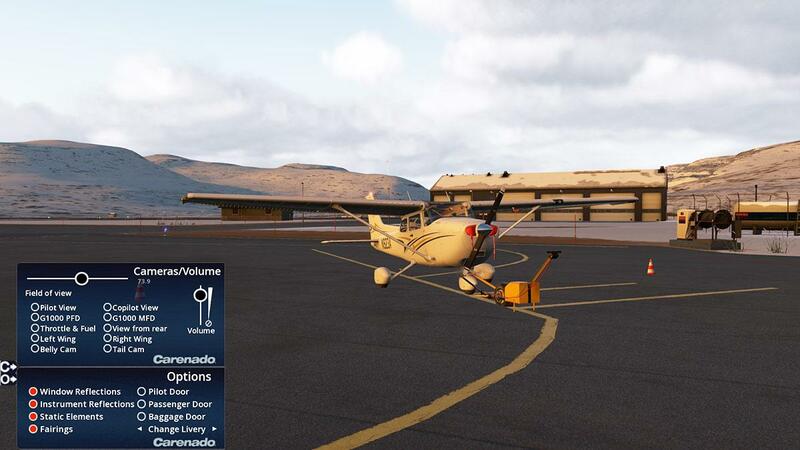 The C172SO is a tiddler of an aircraft, so these effects are going to be minimal. 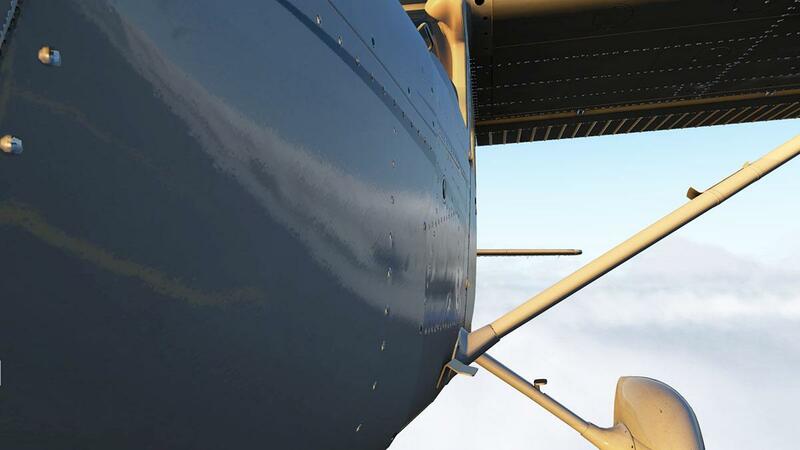 However the hot exhaust is well done, you also get the odd small contrail off the wings and the wheel housings, wet conditions also brings flumes of spray off the propeller thrust, and all give the C172SP a bit more dynamic realism, but the point is that these new particle effects are finely adjusted for this aircraft, and not just with the switch over factor in using 11.30... and there is a difference. You get in the options the choice of the aerodynamic fairings, or the plain open wheels. Strut and assembly wheel detail is of course excellent. 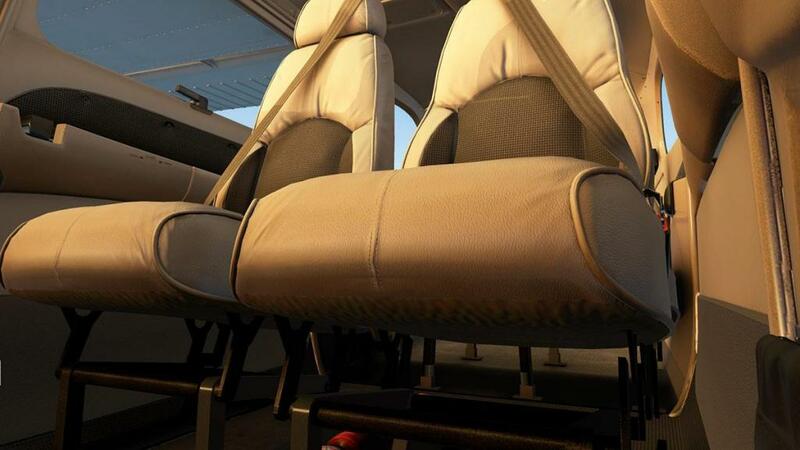 ... but you can still see every single screw, every mesh screen and you can easily read any of the many notices set around the panel and cabin in sharp detail. Glass is marked or worn, but the excellent internal reflections deliver that realism required, and for once the reflections are not set as overwhelming... but perfect. 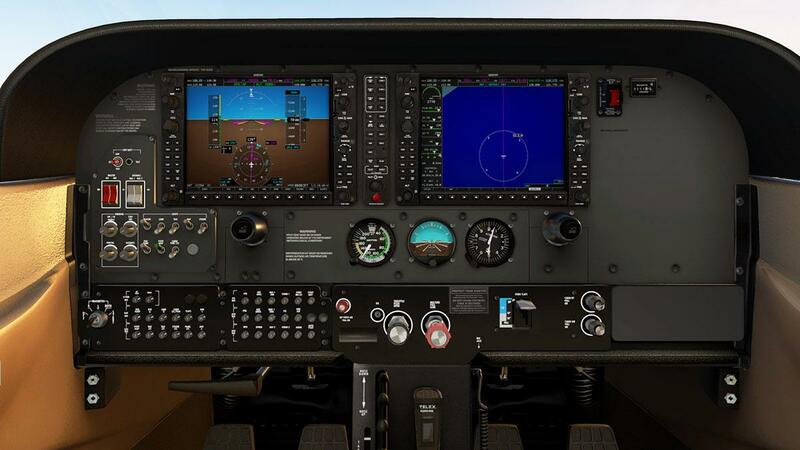 Although the instrument panel surround and to a point the instrument layout itself, it is exactly the same as any other C172 panel. 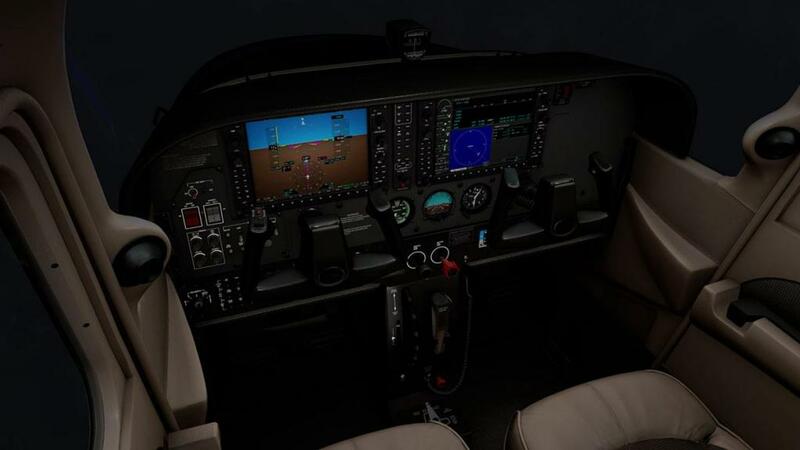 The sharpness of everything is again very clear and realistic when laid out on that nice dark grey background, but also in a very clean if delivering a slightly new aircraft feel. 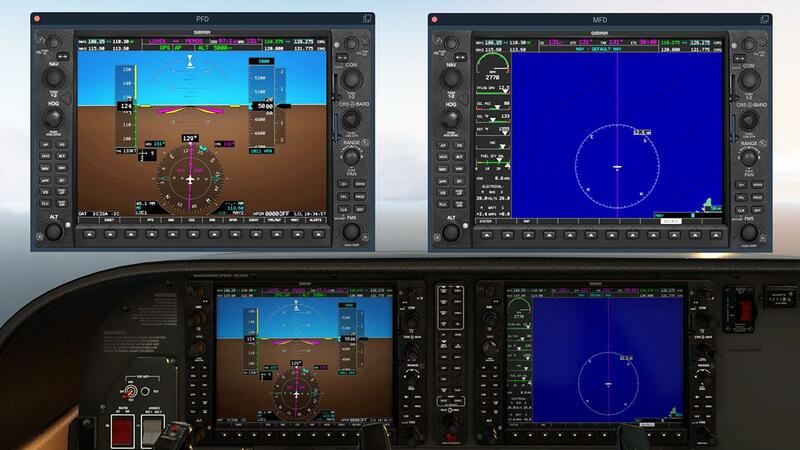 The Garmin G1000 avionics suite does dominate the panel in selection and style. Both Yokes as per usual can be hidden or visual. From the outset the G1000 suite does not look exactly like the Laminar default version, because there have been some visual minor tweeks. 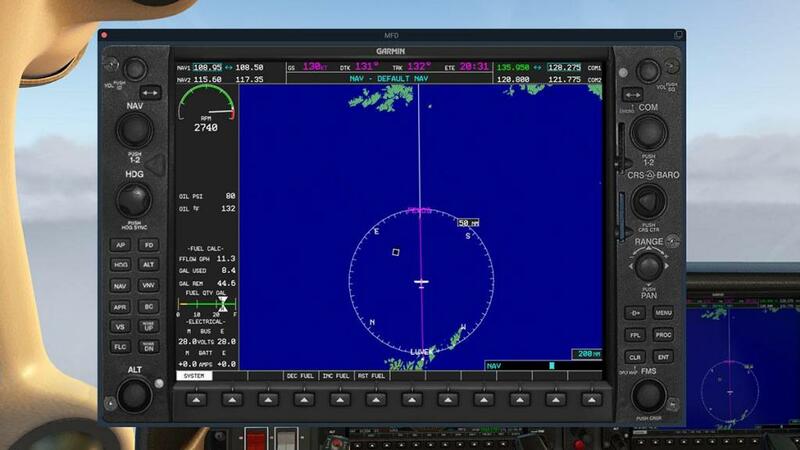 It is the same system, but with the artificial horizon on the PFD (Primary Flight Display) being more authentic with the slight central zone being more lighter (brighter) than around the edges, If you remember (or it still is) the default G1000 system is still a very dark brown lower and hard blue upper horizon, which I never ever really liked... this version is excellent, but I will note the display lightness (non adjustable) in that the displays can be slightly dark at different lighting angles, but again it does look far, far more professional than the default G1000... it is branded as Garmin as well instead of G1000. 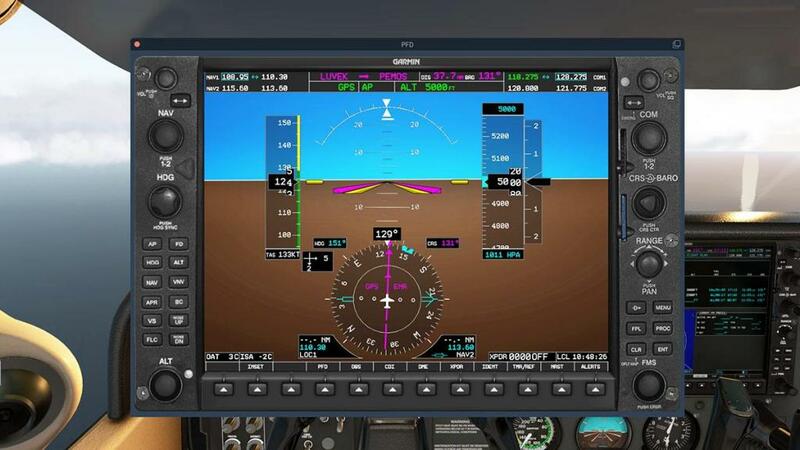 The displays pop-out, but again they are different, in here using the X-Plane11 window layout than just the straight display pop out? 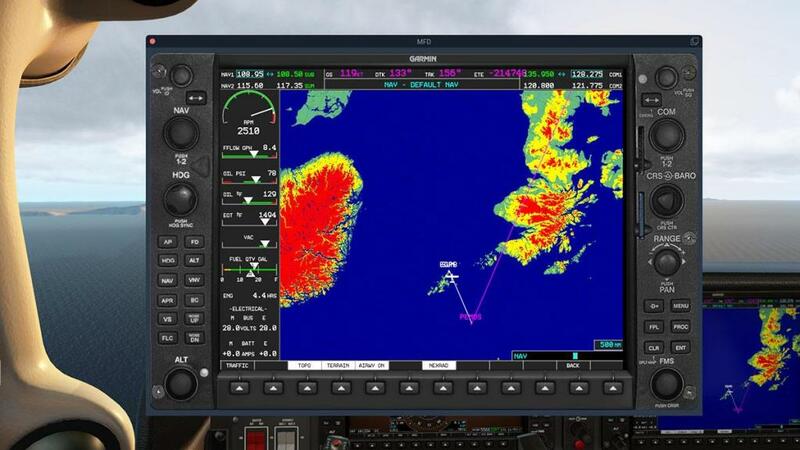 You may not like this version as you have to adjust the blank background areas to fit neatly around the display screen, the default version is just as tricky as the G1000 panel can be pulled out of it's scale and shape, but it does look better without the top tabs... but there is a reason for this new pop-out change, as you can now also pop the window out now as a computer window to separate the displays from the simulator, and that is obviously for home cockpit builders or second monitor screens. 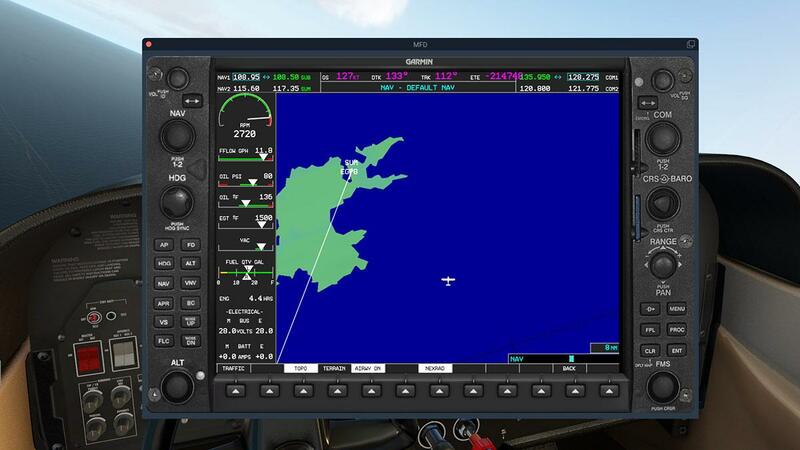 Most are now very familiar with the default G1000 system, but it does still have a lot of depth. 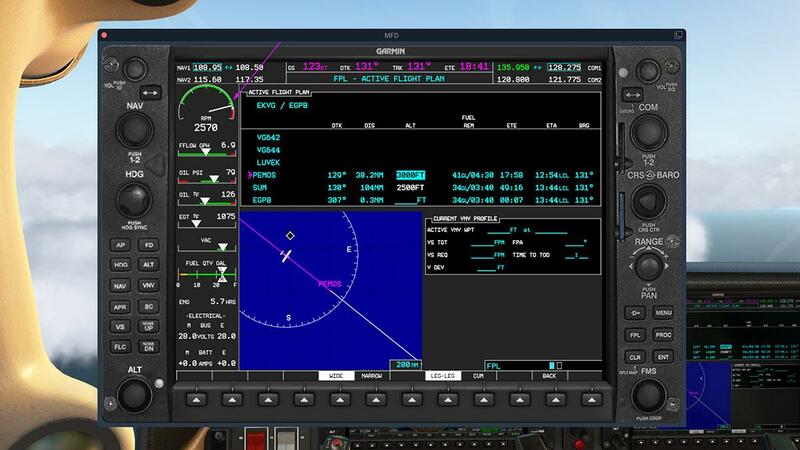 Standard speed and altitude ribbons with built in vertical speed are really good with the rate of turn indicator and all set within the huge Artificial Horizon with built in FD (Flight Director) pointers, as is the radio and autopilot settings in the top banner. 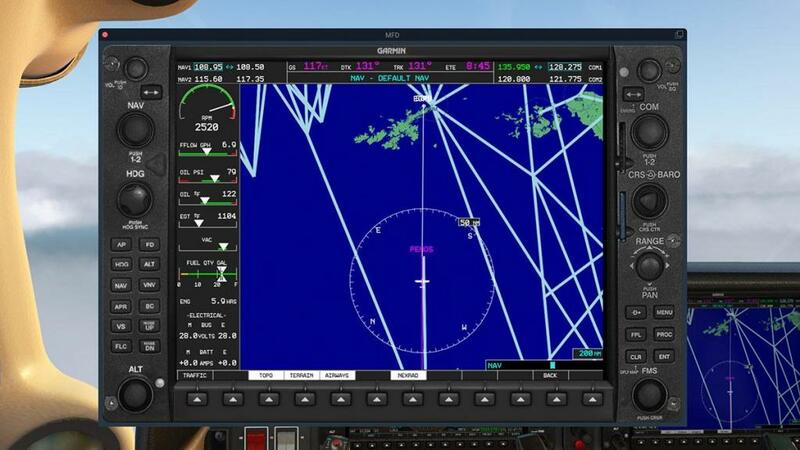 All lower keys access ALERTS, NRST, TMR/REF (Timer) and of course the Wind strength and direction with comes with three settings, and the same three switchable DME/GPS/VOR1/2 backgrounds with all their points shown are on the heading rose dial. I earlier found these menu driven systems quite confusing, but is now far more used to them, but however at times you can still get lost in overriding key settings. 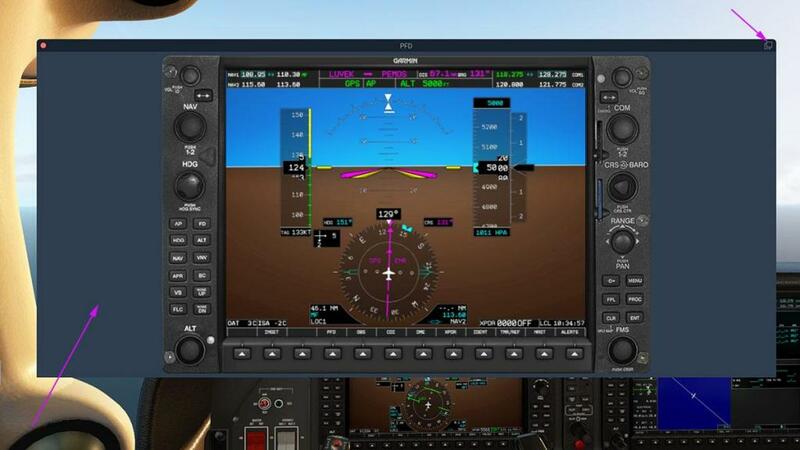 Two set items are the AP (Autopilot) buttons are down the PFD left panel side as well as the MFD (Multi Function Display), and it is surprising that most G1000 layouts don't do this, but habit means I still use the MFD buttons (the yoke covers some of the buttons on the left). 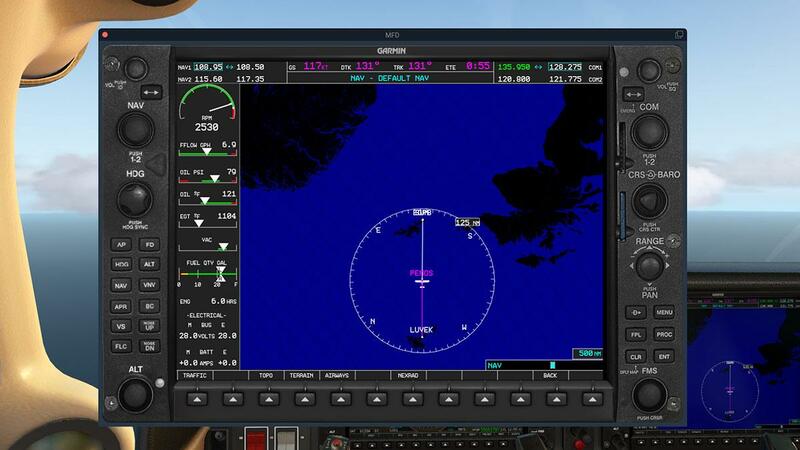 Another item thankfully missing on the PFD is the engine monitor system display, again it crowds up the artificial horizon if set hard in place. On the MFD There has been some quiet additions that rounds the system out more. It feels now far more comprehensive. Engine readout covers RPM, Fuel Flow GPH (Gal per hour), Oil Pressure and Temperature, EGT (Exhaust Gas Temperature ) and Vacuum. Fuel quantity is for both tanks. Lower is the Electrical Bus Volts M and E and Battery amps M and E. System switchover (data) covers top RPM, Oil Pressure and Temp. Fuel Calculations show Fuel Flow GPH, GAL USED, GAL REM (Remain) and can be reset. Lower is the same Electrical Bus Volts and Battery amps. .... Terrain and coloured terrain elevations are all in the package, but overall there are far too many settings and uses for this review. 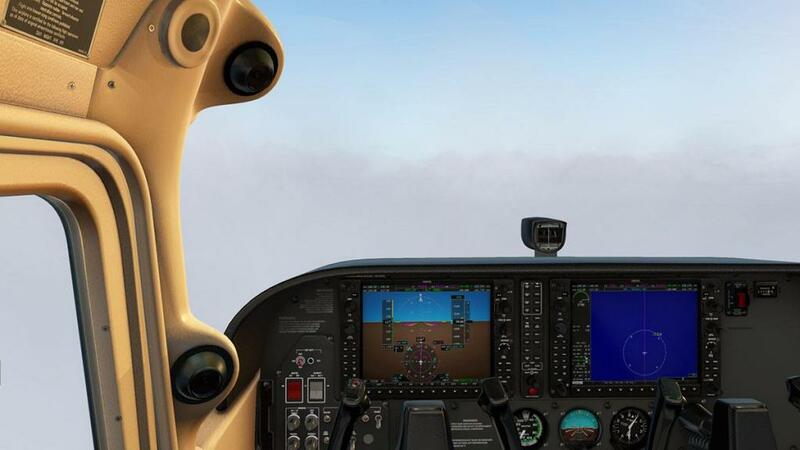 Carenado do provide a full G1000 Manual (Laminar) in the set of documents with the aircraft, it is a long read (133 pages) but if you want to completely master the G1000 avionics system, then it is worth all the effort and time. 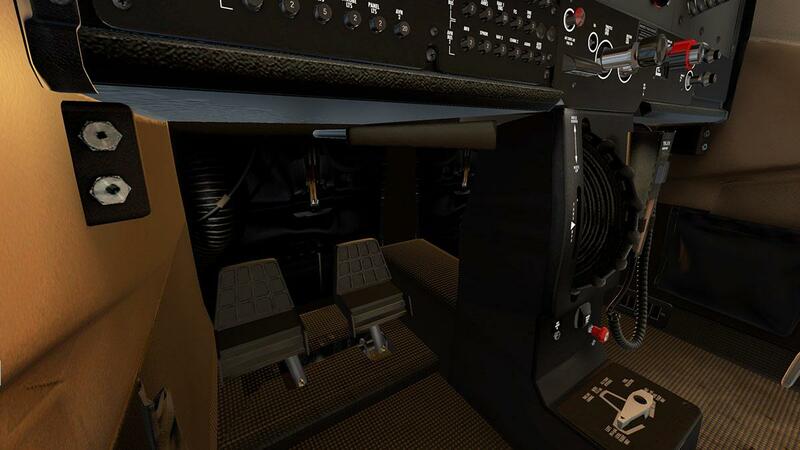 Switchgear dominates, with main power and avionic switches upper left, panel lighting adjustment and external lighting switches below. 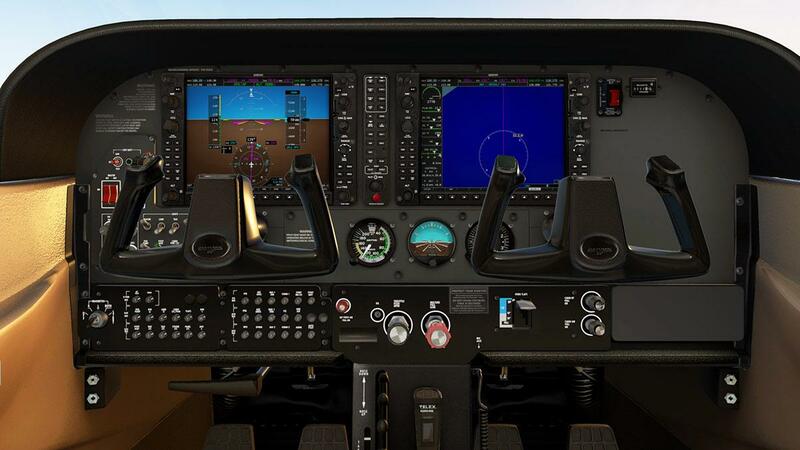 Center are three backup analog dials that cover Speed, Artificial Horizon and Altitude. 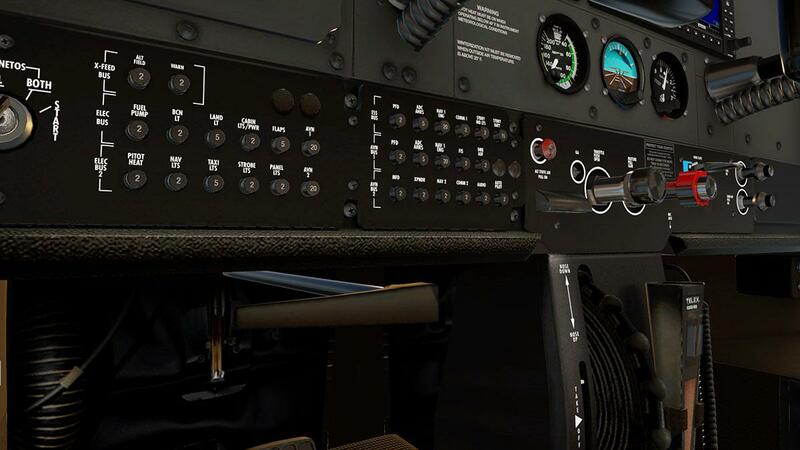 Lower panel is the starter switch, fuses, throttle and mixture levers... far right is the three stage flaps lever with UP - 10º - 20º - FULL positions with a nice graphic showing the flap extraction speeds. Two knobs cover cabin heat and cooling... One switch is interesting as it is noted as "Cabin PWR 12V" that has an outlet on the lower centre console panel, and a higher set switch that is the "Standby Batt" Standby Battery switch. 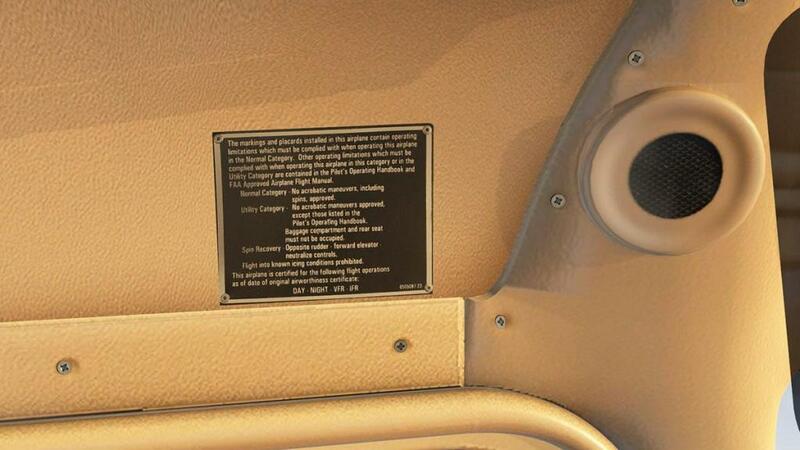 Lower is the park brake handle left, rotating pitch trim wheel, and fuel selector on the floor. Fuel selection can left or right tanks or both, but there is a pull knob to shut off the fuel supply (in red). 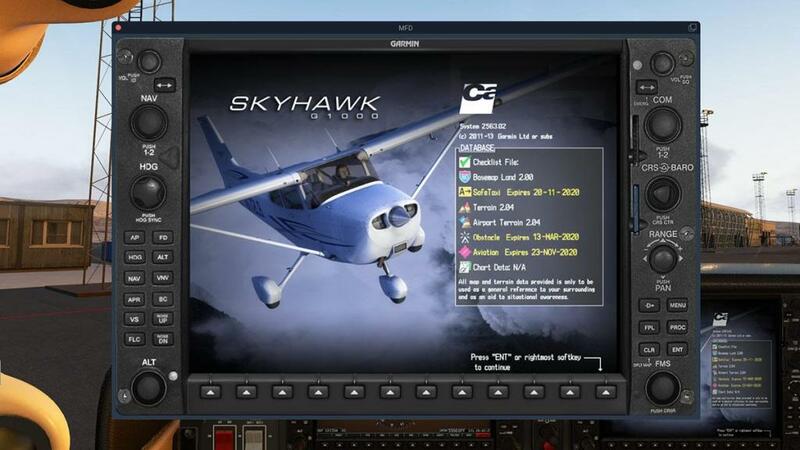 The standard two Carenado me﻿nu tabs are on the left lower screen with selections: C ) Is for the standard Carenado with ten preselected Views, Field of View and Volume panel but included are now two views for each of the new G1000 displays. And O ) which is the Options panel. 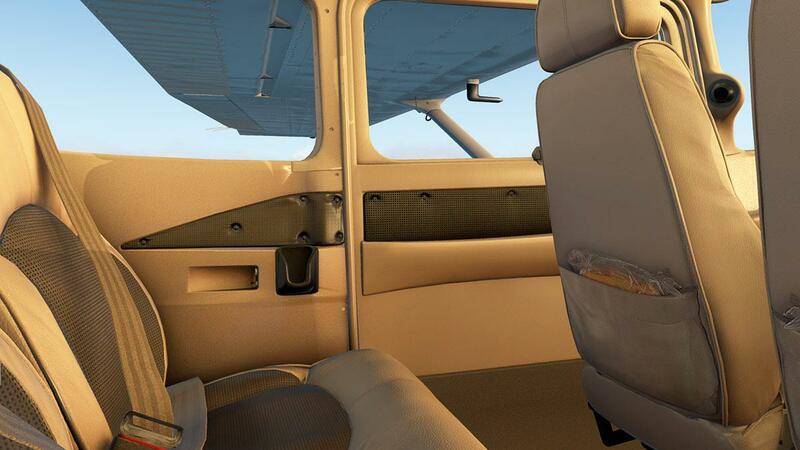 Options include Window and Instrument reflections. The Static elements provided and here they are still quite basic with only two cones, manual electric aircraft puller, engine inlet and flag pitot covers, but no chocks? The wheel "Fairing" selection is here as well. 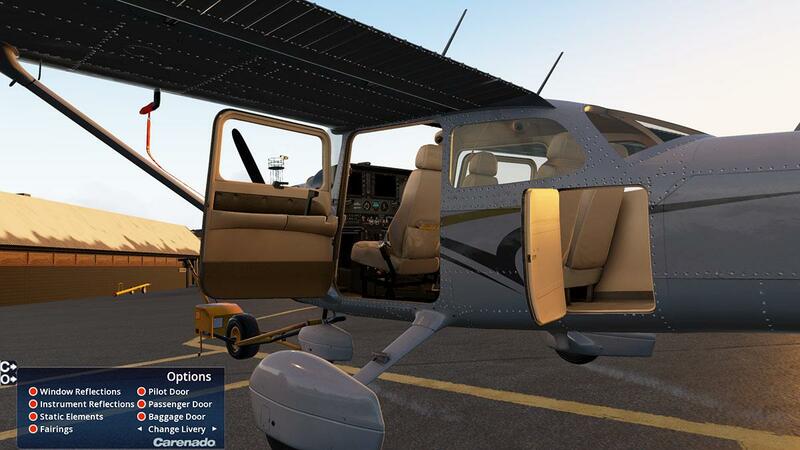 Door animations include both pilot and co-pilot doors and a small baggage door left rear (behind the rear seats). 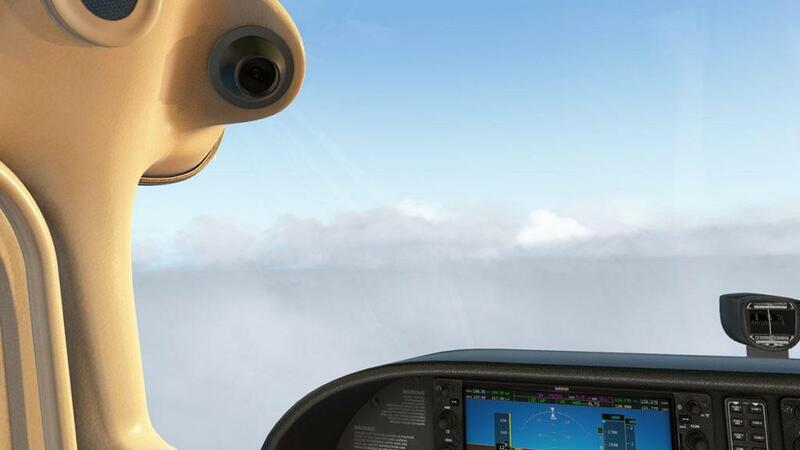 The twin highly realistic (and new) animated pilots do disappear when you activate the static elements. This classic Carenado menu system has been in operation for ages, and yes it is tested and true. But I am starting to find it a bit limiting compared now with other GA aircraft offerings of the same category. It is in the flexibility that you miss. 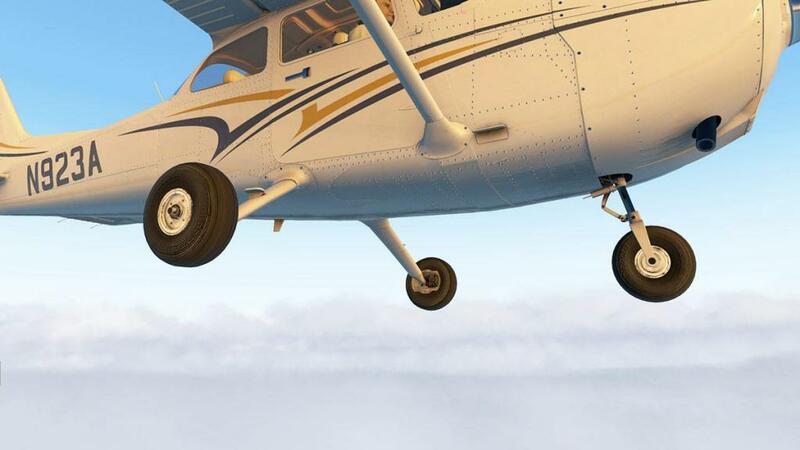 If say you have the static options on then you get everything including the ugly puller, as there is no flexibility to say to just have the chocks, or the tie-downs or even the pilots off/on as it is simply all or nothing? Fuel was 133kgs (as noted by SimBrief), but the actual block fuel was only 49kg for the actual trip, but 53kg extra was needed for any diversion? At least it gave you a security blanket. 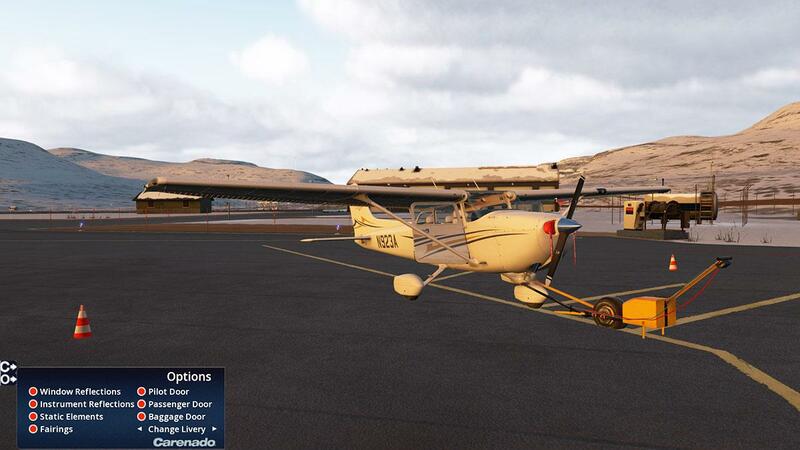 Pre-flight checks done and the 133kgs of fuel loaded, it was time to warm up the engine. 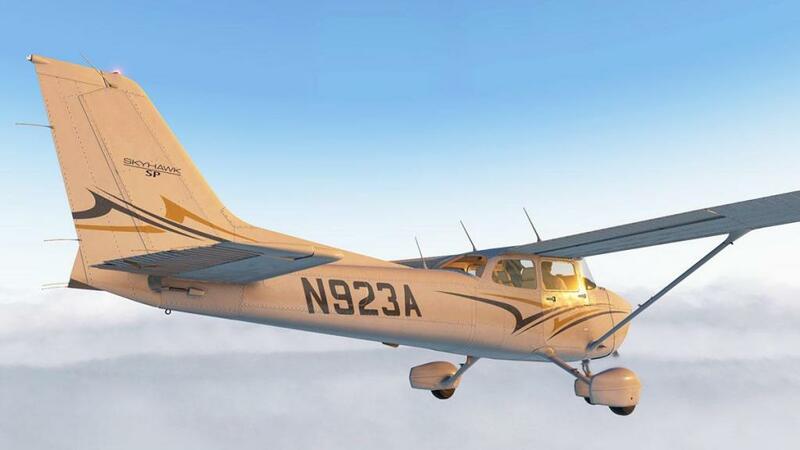 You have to have the "Stby Batt" armed (for the extra heave to start the engine) and set the fuel selection to both tanks.. it took about 4 min running to get the Lycoming O-320-D2J (160 hp (119 kW) at 2700 rpm) up to the right temperatures. 11.30 has more functionality with carb icing and fuel flow with icing... but in the C172 you don't have a lot of control over that. 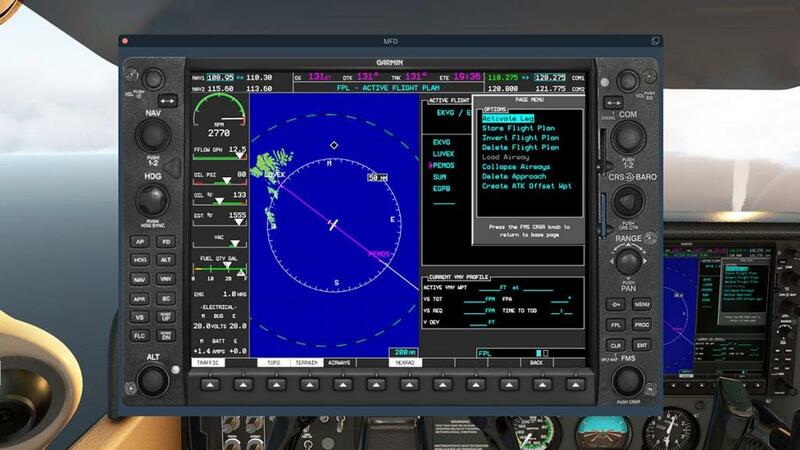 So you have to be aware of the engine instruments to watch out for any inconsistencies, so this is not the review to convey or review those 11.30 changes, anyway a twin-prop would be a better aircraft to observe and document the effects. 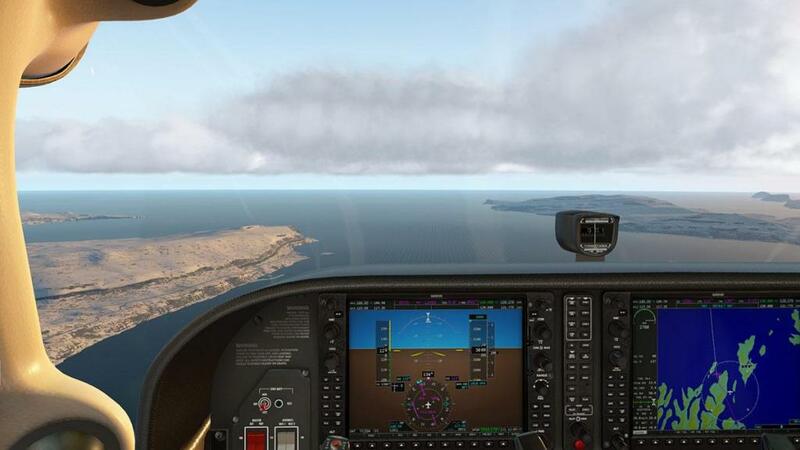 A bit of throttle and you instantly realise you don't need that usual Carenado high forward movement here to turn the aircraft, as the 172SP will turn almost as soon as you are moving, it all feels smoother as well. 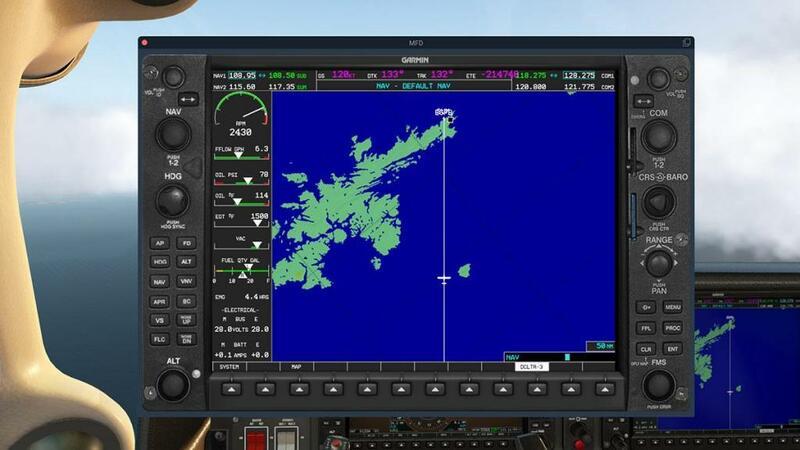 Note the PFD display, dull in the shade but perfect in the bright light. 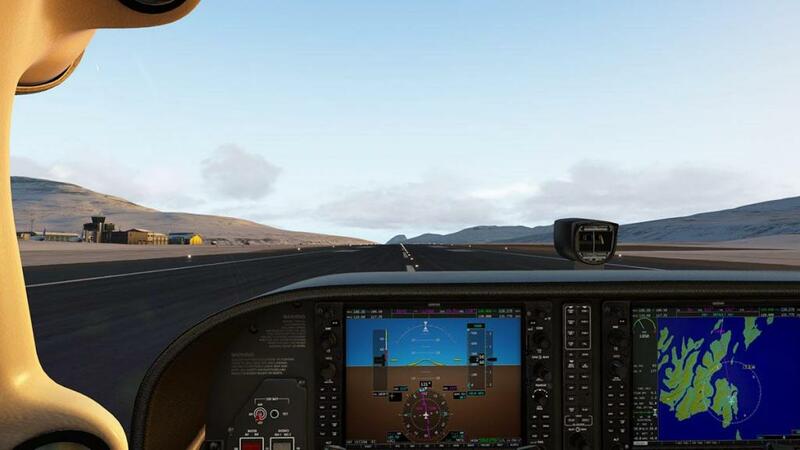 You still can't use wide movements to steer the Cessna, just slight intricate motions to keep it straight, again it does feel far smoother. 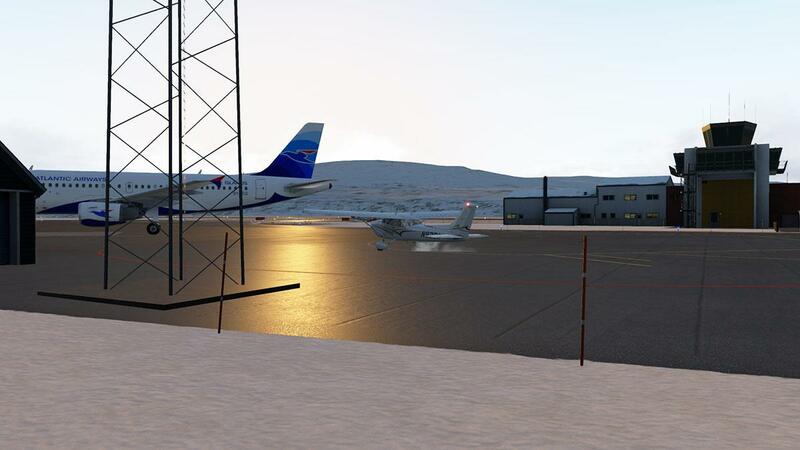 Line up on RWY12 and a last check around the instruments. You still need that Carenado very slow throttle adjustment as you add in the power, as the C172SP will still pull heavily to the right under the prop thrust, you go from a little right rudder to a lot of right rudder to again a little right rudder as the speed builds, it can be still quite slippery almost yawing if you push in the power too hard, but there is an enormous amount of feel being fed back to you and far more than before... personally I like it a lot, the 11.30 dynamics are certainly better in this Cessna, but I am still doubting if Laminar have still got the ground friction numbers right, more time and different aircraft will build up that theory, but my first feel is no. 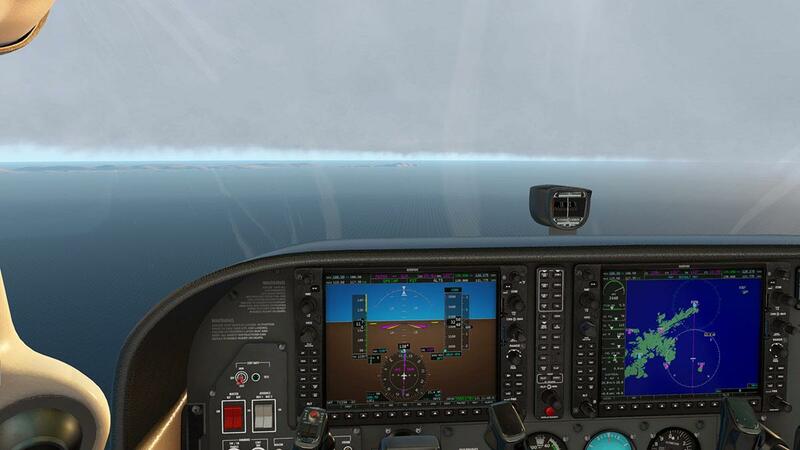 550fpm is the climb out rate and the aircraft feels sprightly for the 1160 kg all up weight. 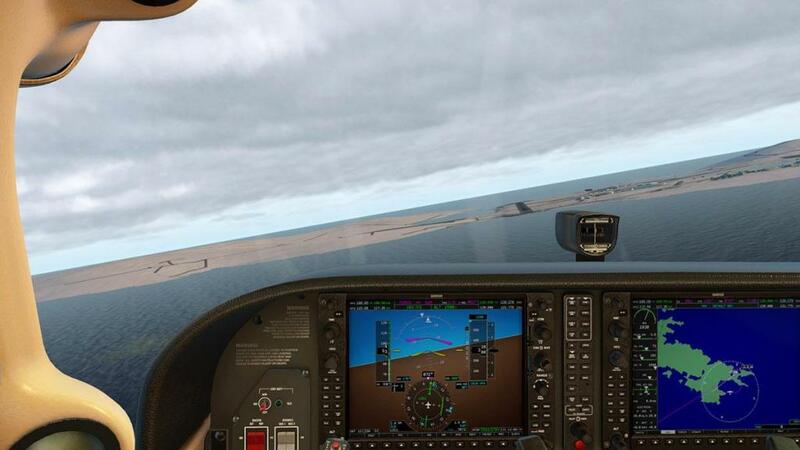 Handling... very impressive and responsive, I love the feel of the aircraft, as it feels about perfect. 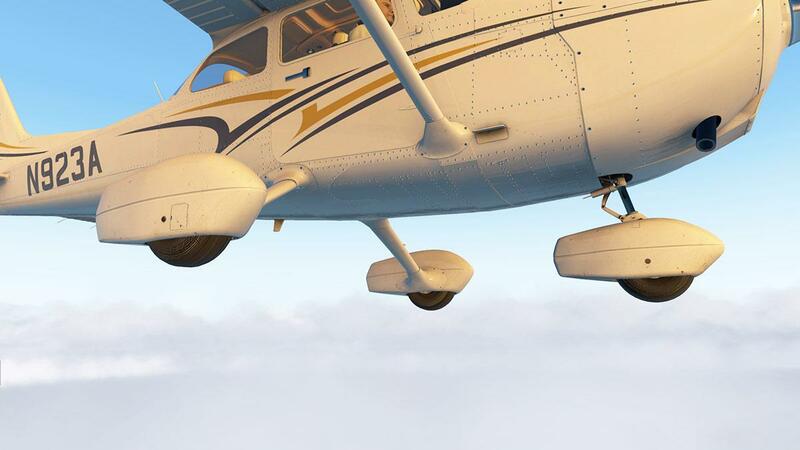 I am climbing up to 3000ft, then trimming the aircraft out which is easy (and to do the adjustment) and getting the aircraft stable. You only have a pitch trim, so you have to watch any drift to the left or right, but in reality, however when once trimmed out you can adjust even any direction with slight single finger movements of corrections... lovely. 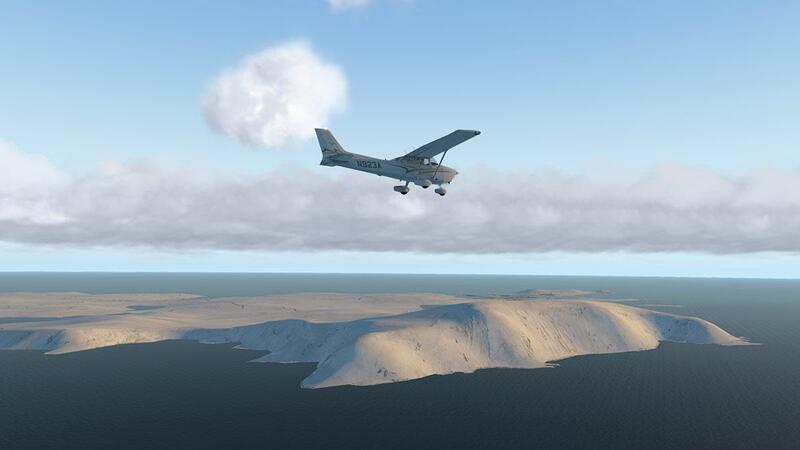 The flightplan takes the aircraft over the main island of Streymoy, but I want to go around the headland before joining up to the plan, it gives you a bit of a better sightseeing view as well... it is lovely up here in the crisp clean morning light. Once on the right track I decided to climb up to 5,000ft, up out of any low cloud. 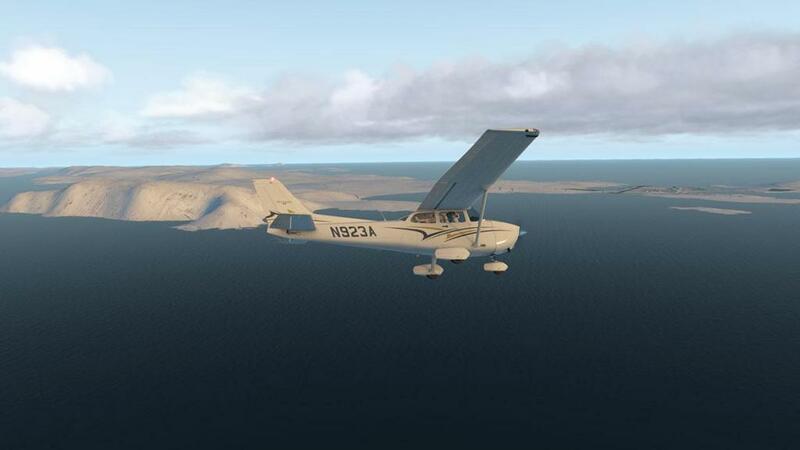 SimBrief noted to stay at 3,000ft, but 5,000ft felt like the better option. 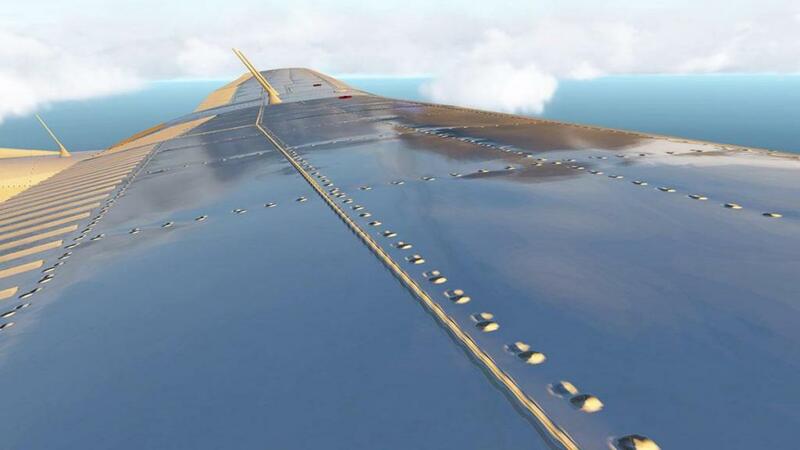 Climb was at 450fpm, with the mixture high in not losing any speed, once I got up to the altitude I leaned the aircraft out and settled in for the long passage. ... from full navigation screens to both narrow and wide flightplan views... note leaning the fuel to find the right balance is a bit of an art, but if you find the right point of just on the white band on the RPM you will find the rest of the fuel flow and engine temperatures will fall into place, depending of course on the weather conditions. 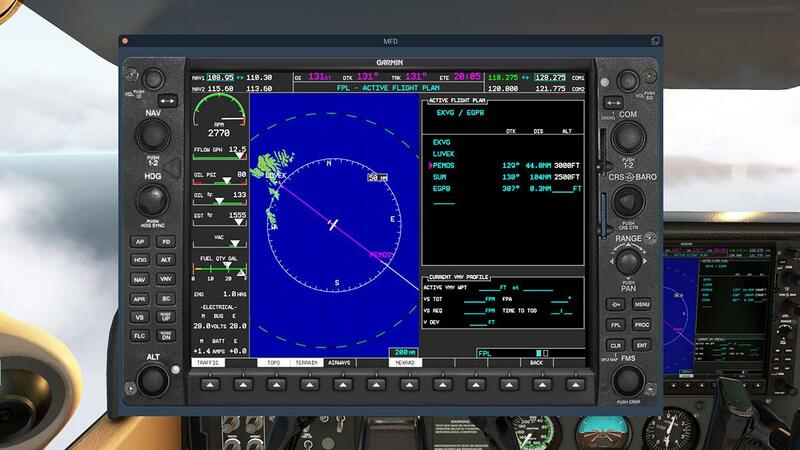 Topo, Terrain and airways can all be shown and used... One odd thing is that the standard manipulators on the panel are different to the pop-out hand pointers? The hand pointers can be hard to use until you work out where the active areas are? 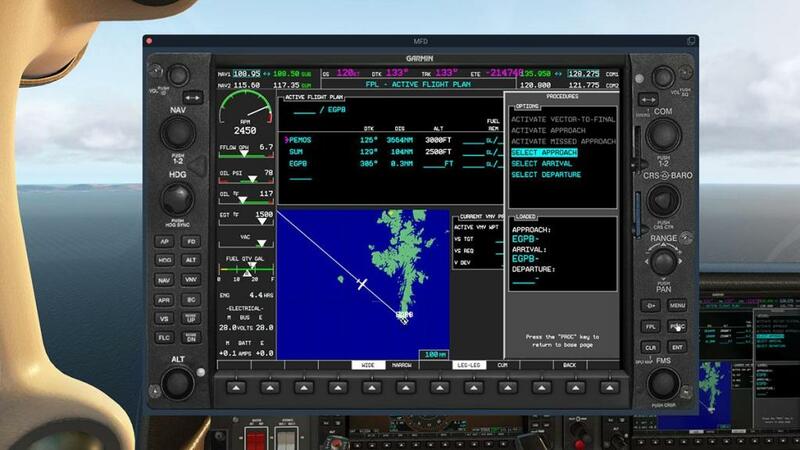 They change into an emergency "get you home" mode, with a black background and PFD instruments on the MFD, and the engine display comes on in the PFD, if you like this style then it is yours to use, but access to the panels are restricted.... it is only a get you home tool. Sounds are FMOD and come with the usual 360º doppler effect. 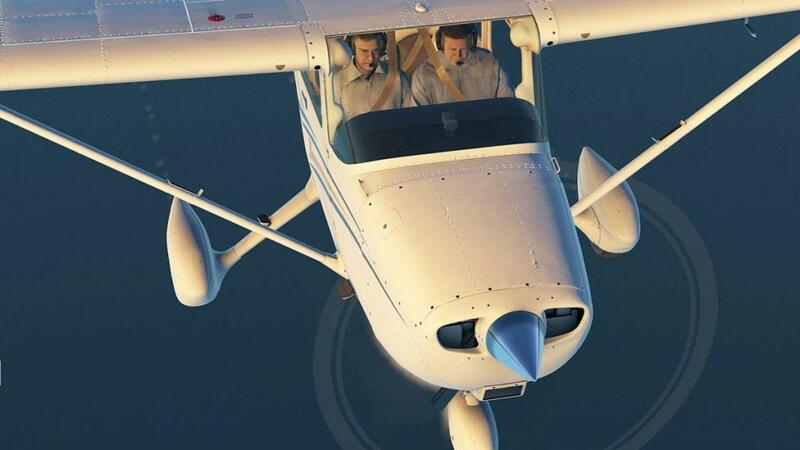 They are of course very good, but the C172 does not come with a huge range of sounds, the bonus is of course they all sound really good, as they don't have those bad repetitive or droning phases that drive you so batso or annoy you. all in all the sounds covered the full spectrum that you want and you enjoy the aural experience. The Shetlands are now large on the map, so it is time to lower the altitude, and set below the cloud cover are the islands... when descending you have to work the throttle with a bit of feel and precision, so as to not let the speed runway as you descend and then rethrottle perfectly when you arrive at your altitude so as you don't lose too much speed... all management. .... at least the weather is good, it is a hard and even a dangerous approach in bad weather, which is usually most of the time up here. My old style approaches are now landing me too high and too long? speed is correct under flap FULL, but the C172SP just won't descend or slightly floats in the final section of flight.... 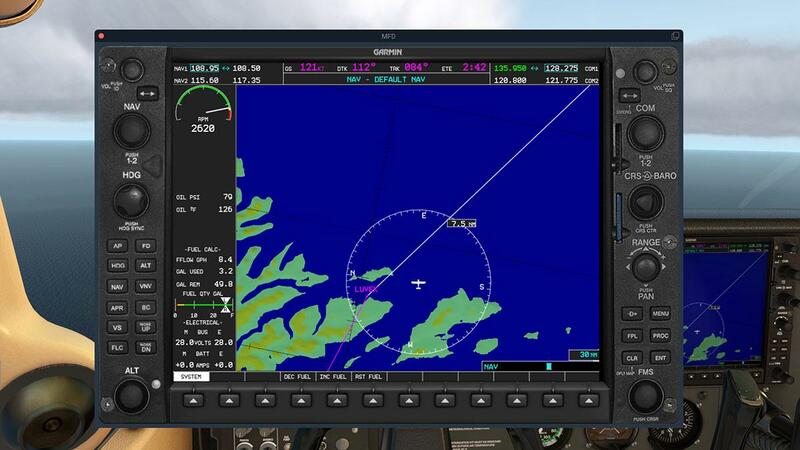 I feel I need to be more braver on the lower throttle speed. 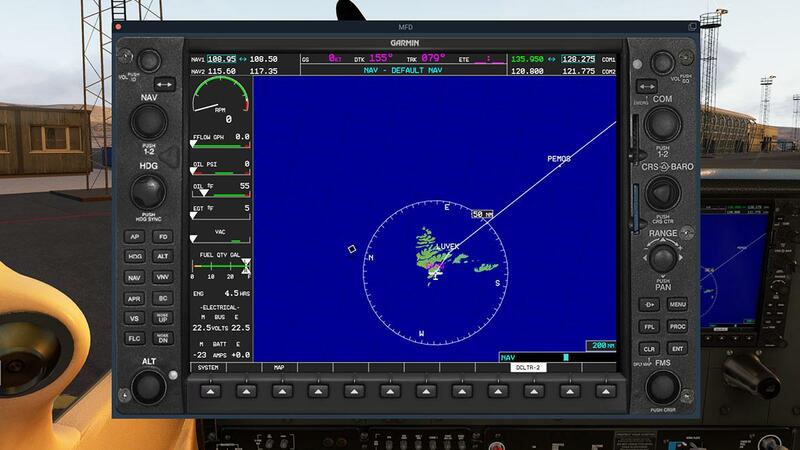 60knts-58knts is the balance speed, go too high and you float, but go below and you start to stall (Stall is a low 40 knts).... tricky but fun. 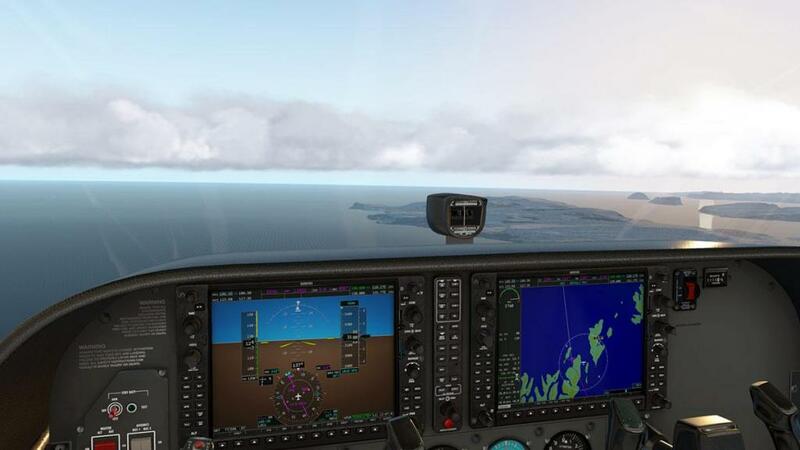 The numbers worked for you as well which shows that the simulation of the aircraft was excellent... 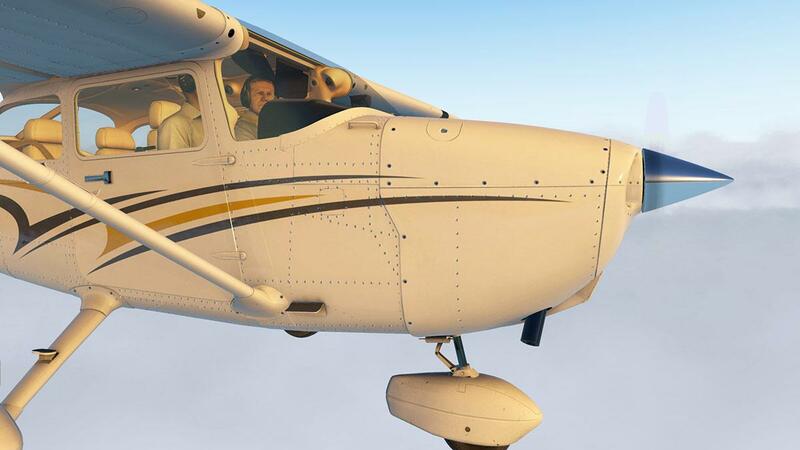 I used in fuel 53 kg (SimBrief noted 49 kgs) but that was at 3,000ft and not 5,000ft, so my guessing with the extra climb and engine warm up is that the fuel use was on the number. 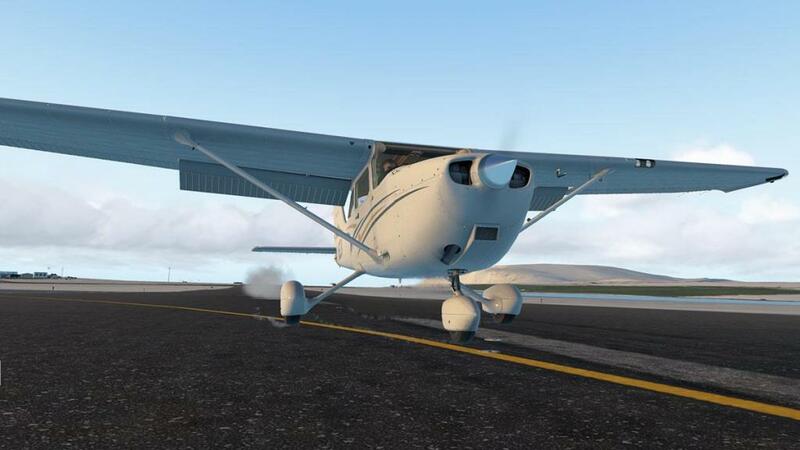 It will be interesting too look back at this review when I have flown a few more types of aircraft that have been processed in the new 11.30 dynamics, but let me stress this isn't the Carenado C172SP here or even X-Plane itself, but me in adjusting to the new feel and dynamics, overall it is excellent, far more smoother to your inputs and I didn't get or feel that huge downward pull of the X-Plane landing phase... and maybe that is the answer in my landing hesitation in the fact I am always ready to counter that negative landing effect, and maybe it is now in 11.30 not as overwhelmingly strong a force as it was before? Internal and panel lighting is quite basic, but very good. 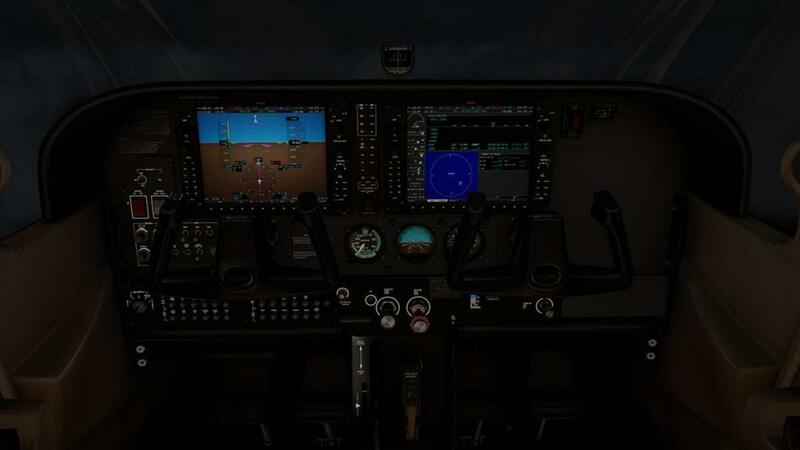 You can get the right amount of lighting, but still have very good vision out of the windscreen at night, although the reflections can be strong... here again those slightly dull G1000 displays work to your advantage, and are not over bright in your face... very nice. 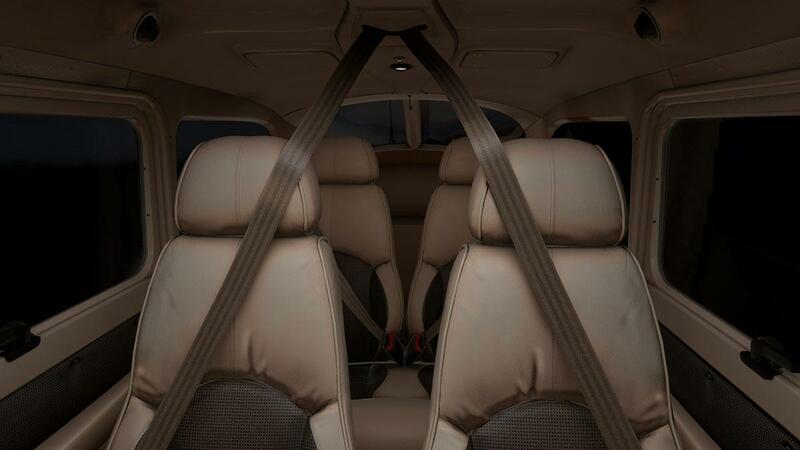 There are two adjustable (map) lights in the roof over the front seats that illuminates the two front seats and the rear is illuminated by a single on/off switch overhead light. 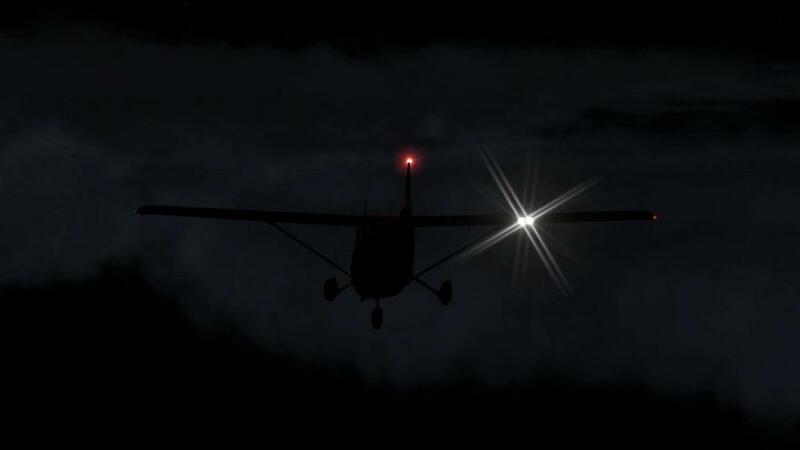 Externally again it is basic... navigation lights, tail beacon and twin in left wing lights for taxi and landing (SP version and above), for once they all feel nicely adjusted. The strobes are bright and sharp, but if you like your replays then fly with them switched off as they are static over bright and don't flash? 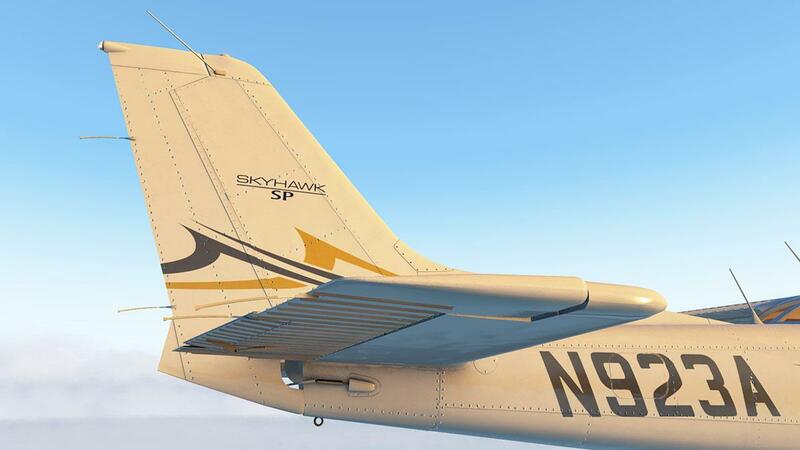 You get the standard Carenado livery set with a white blank, then five all American registered designs. Quality as noted is extremely high (4K 4096x4096) resolution, but the designs are all a basic wave or flame on a white background airframe design... so overall they all come out a little boring, Carenado needs to get a little more creative, and add in a few more variations. 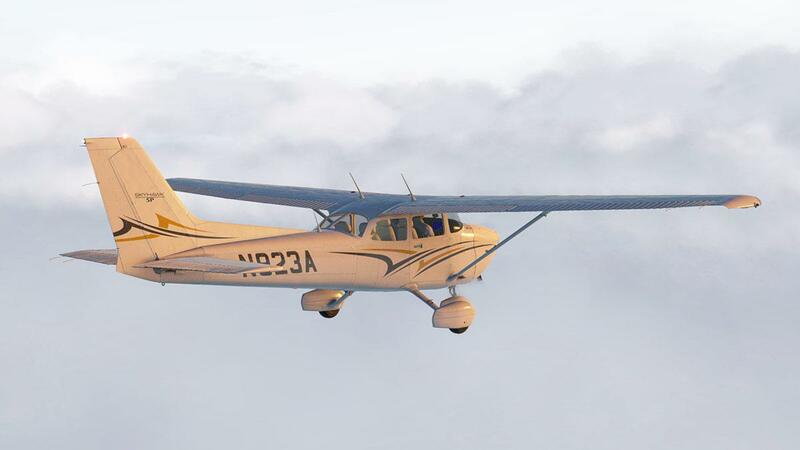 Don't even compare this Cessna 172SP to any other Carenado (or Alabeo) C172's, as for one it is all brand new from the ground up, effectively a new aircraft, the odd thing is it doesn't look it, until you really look at it's amazing skin and highly detailed design. 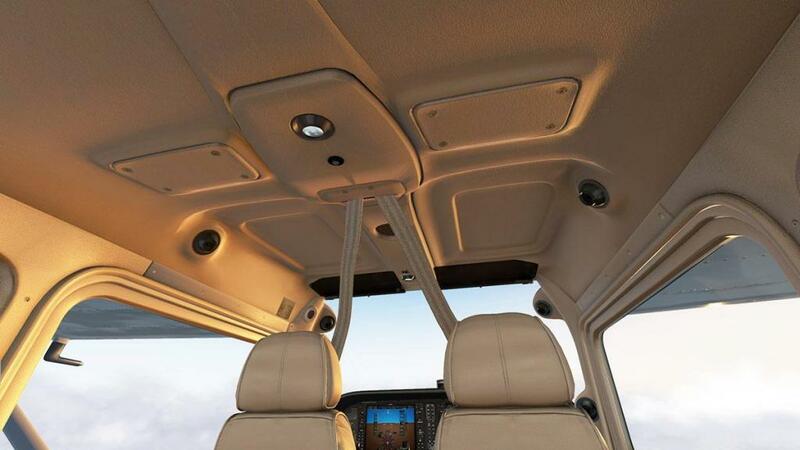 The interior is all new and modern as well, and of course it comes with the latest Garmin G1000 avionics suite, but again even that default system has had some nice tweeks to make it feel all very non-default in look and feel. 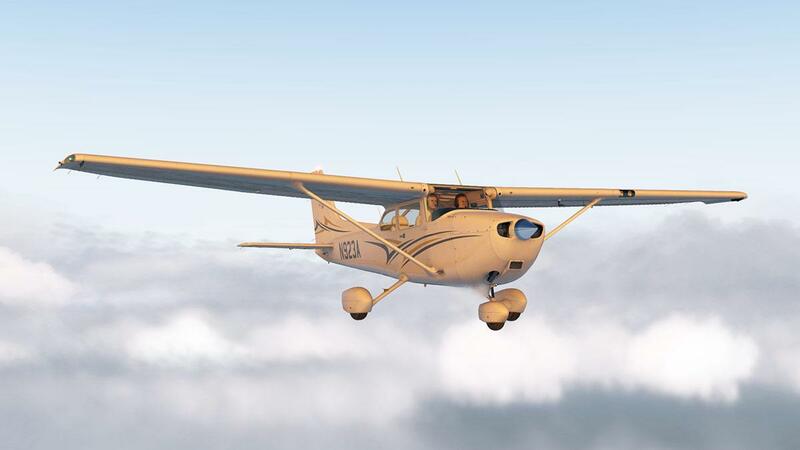 The 11.30 enhancements are also the a nice top layer of a very nice all rounded cake, as the C172 flies like a dream and so overall it is quite a nice if perfect little aircraft. But I will note the Carenado brand as a whole as it is in some ways related to this aircraft. 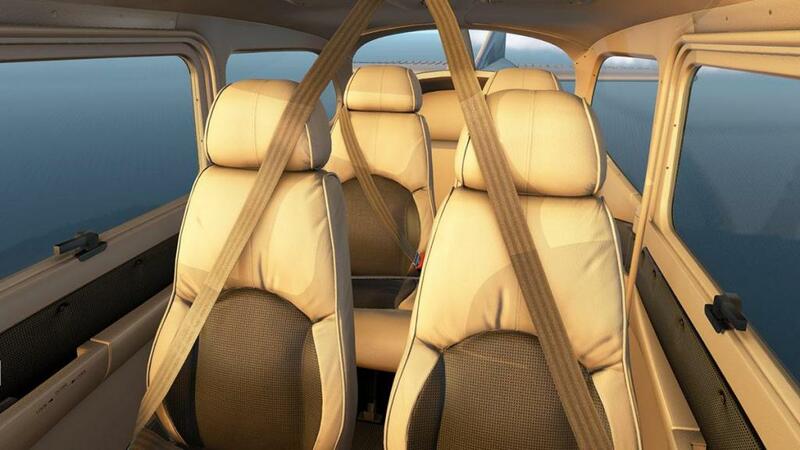 No doubt any earlier Carenado aircraft were very high in the list of quality and design, and to a point they had that exclusive mantle to themselves. 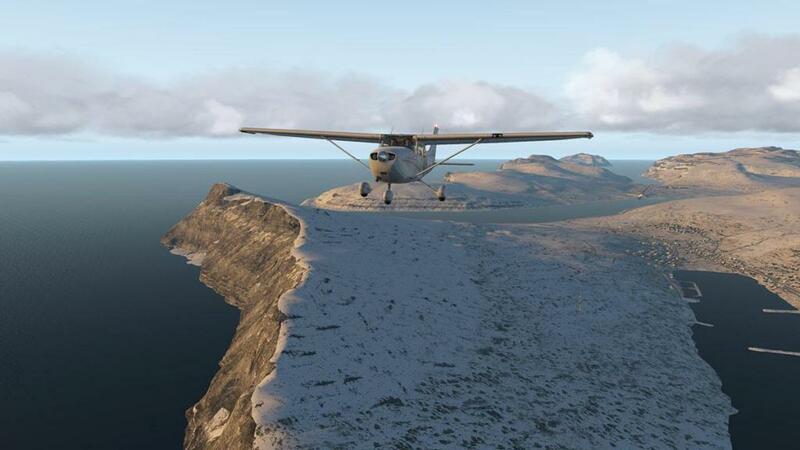 But Carenado have been around now for a few years, even in X-Plane, and make no doubt in many areas like the sheer quality on show here with is amazing C172SP. You are however now still starting and in getting the feeling that in areas Carenado are becoming too stiff in their packages. 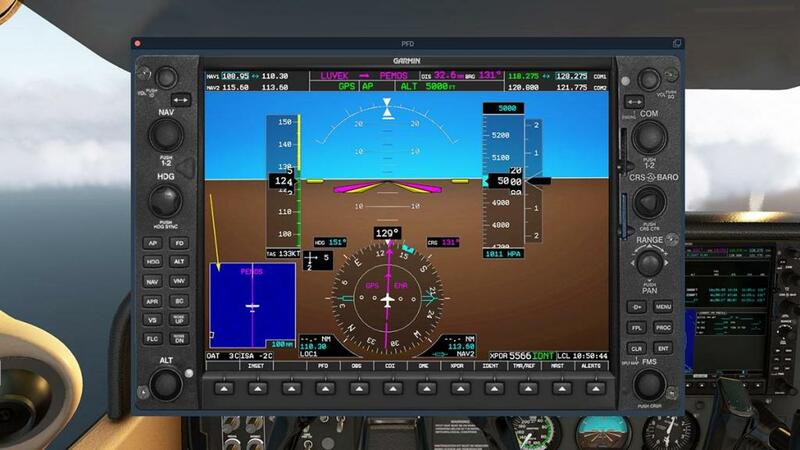 Notably in the menu's and features, and that many features that were also standard are now slowly disappearing, like here with the loss of the animated wing edge wicks or chocks, so overall the Carenado's are starting to feel quite basic and not as feature filled as before, and no doubt the opposition are closing in fast and delivering what Carenado don't, the Weights and Balance menu's, separate static elements, active fuses, and not only in supplying a few boring liveries and even a manual to work out the instruments... you sort of get the idea. 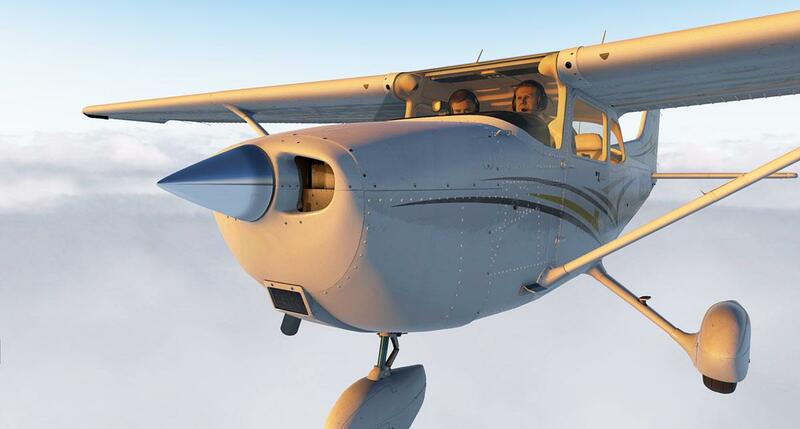 So the main aspect of this review is why buy the same type of aircraft that is essentially available for free, and comes also built in with X-Plane, but believe it or not there is a significant difference. I'll come back to that ownership feel. Yes the Laminar C172SP is a nice aircraft, but it is quite basic and to be honest it doesn't have any intimate feel about it, not only in the flying aspect, but as an aircraft as a whole... fly this Careando version and you feel like you have signed the purchase papers for it, you will want to run your hands down it's flanks and say "it is all mine"... all MINE and "I love my little C172" and that it is a significant feeling to actually own it, and keep it in your life for the rest of X-Plane11 and even pay to have it all back again for X-Plane12. 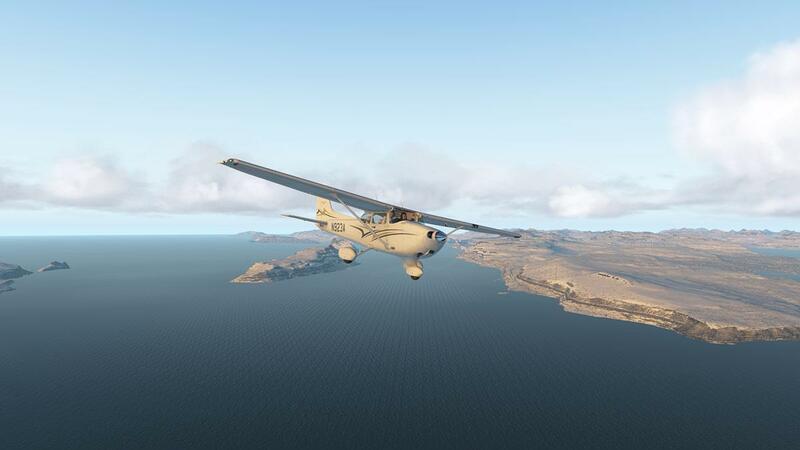 In other words it is perfect, in a Carenado sort of way... and you will fly it around for hours and hours of absolute joy and maximum simulation, and that is far better deal instead of being stuck in a boring default bland Cessna, even if it is free... Highly Recommended. Download for the C172SP Skyhawk is 390mb and the unzipped file deposited in the aircraft "General Aviation" X-Plane folder at 461.40mb. Overall Carenado provide a lot of documents, including the full Laminar Research G1000 operations manual.